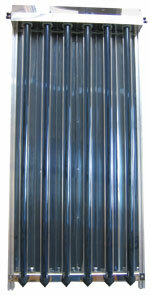 KTU evacuated-tube solar collectors use vacuum as a thermal insulation, formed between two glass tubes. A highly selective absorption coating is applied to the inner tube. The heat gained is conducted by special aluminum lamellas into copper tubes where a special fluid circulates. Thanks to this, thermal loss of tubular collectors is very low and the collectors may gain heat even in a very weak sunshine (cloudy weather – radiation diffusion) or under extreme weather conditions (a low air temperature and a high temperature of the liquid to be heated). Why do the KTU tube collectors show so excellent parameters? Vacuum insulation in glass tubes. A tube consists of 2 coaxial glass tubes with vacuum between them. The ends of the tubes are sealed so the vacuum stability is guaranteed for a long time. 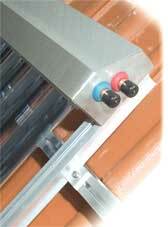 So the collector absorber is placed in vacuum which is ideal insulation and minimizes heat losses like e.g. a vacuum flask. Thanks to that, even the minimum heat gain during bad weather doesn’t get lost and warms up the fluid in the collector. The absorption surface that changes the incident radiation to heat has a tubular shape. The collector exposes the same surface area to the incident sunshine in the morning, at midday and in the evening. 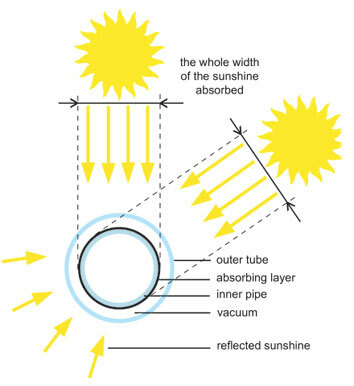 The tubular absorption area makes it possible to gain heat also from the diffuse solar radiation. The absorption surface area for diffuse radiation is more than 3 times bigger than that for direct sunshine. Thanks to this, KTU collectors have heat gains even at bad weather. Solar fluid passes through a U-shaped copper tube down to the tube and when warmed up, it returns up to the header pipe. An aluminum lamella gathers heat from the entire inner surface of the evacuated tube and transfers it to the solar fluid inside the copper tube. The lamella fits precisely to the glass tube and embraces tightly the copper tube with solar fluid. Thanks to this and to the very short distance between the absorber and the solar fluid the heat transfer is highly effective. Thermal insulation of the header pipe is formed by a 3cm layer of mineral wool with transverse-oriented fibres and an aluminum foil for minimizing heat losses of the header. We develop and manufacture Regulus solar collectors in the Czech Republic. Their excellent parameters and mechanical resistance are verified by a Certificate from an authorized body according to the latest European standard EN 12975-2. This standard involves among others also measurement of the output and efficiency, of mechanical resistance incl. 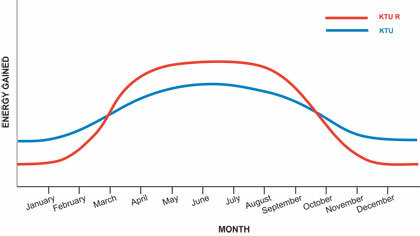 hail resistance and long-term weather resistance. The collector header consists of two copper pipes. 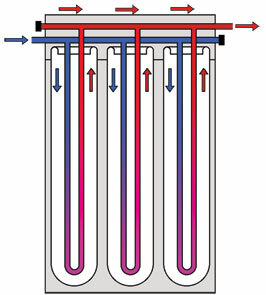 The lower pipe brings liquid into the collector, the upper pipe takes the warmed up liquid from the collector. The collectors can be easily connected into large collector arrays. Liquid of the same temperature is lead into all the collectors in an array and so the efficiency is higher. 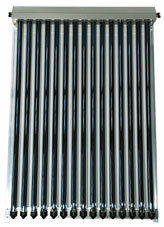 A hydraulic resistance of a collector array is low due to the twopipe connection with a big diameter of the header pipes. Such a connection scheme guarantees a high efficiency of the collectors and a low consumption of the solar pump. KTU R collector is fitted with a large shaped reflector that concentrates solar radiation from a large area to the tube absorption surface. KTU R collectors offer a higher peak power output. KTU collector has no reflector sheet but has more tubes that utilize the full absorption area in a wide solar angle of 110°. KTU collectors offer a more even power output throughout the year.